For the past few years, in the fall, the boys and I have taken a road trip to Hope Orchards for our annual supply of pears. As much as I didn’t want to, I’d actually resigned myself to skipping the trip and the pears this year, given the chaotic state of our lives with the move (and all the yet to be harvested kale patiently waiting for my attention), reminding myself that sanity was at least (or almost?) as important as a pantry full of home-canned goods. 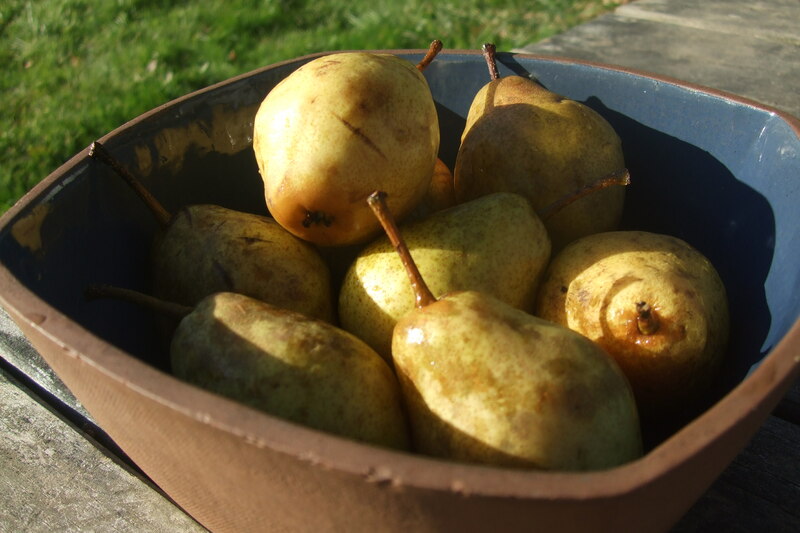 But then….a generous soul in one of the email groups that I participate in was giving away all of the pears from the tree in his back yard! I mean, how could I refuse THAT? So that’s how I acquired, oh, about 70 pound of pears. My step-mom Ann came over and we canned a lot of them in unsweetened apple juice. 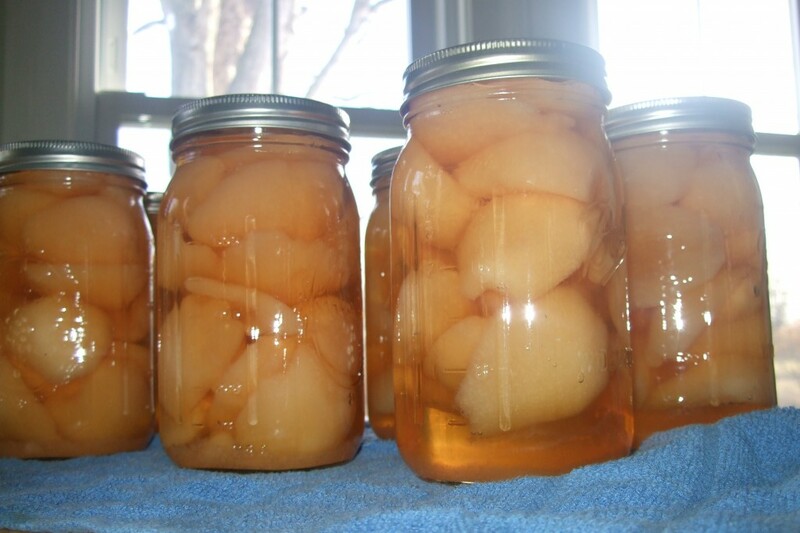 This is one of my favorite ways to preserve pears, and over the past few years pears put up this way have become one of the work horses our pantry, as they’re a great winter time substitute for fresh fruit, and they don’t contain any added sugar–just what’s found naturally in the apple juice. I also did a lot of dehydrating, which is another great option. They’re very sweet and delightfully chewy. This is probably my boys’ favorite ways to eat them–and yes, sadly, our stash of dried pears is already gone….and it’s only January! I made one of my favorite jams, too–pear-ginger jam. Thank goodness the pears were quite under-ripe when I got them……that bought me some extra time, and somehow I managed to get them all put up before they spoiled. Here’s to a quite unexpected pantry full of pears! 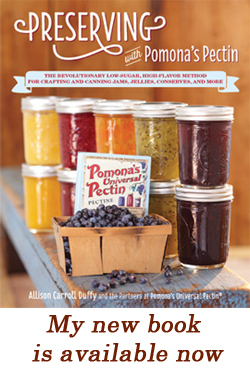 Note: this recipe requires 1 package of Pomona’s Universal Pectin, available at specialty and natural food stores. ***Wash and rinse pint jars, lids, and screw bands. Set screw bands aside until ready to use. Place jars in hot water bath canner, fill at least 2/3 of the way full with water, and bring to a boil. Sterilize jars for 10 minutes, then turn down heat and let jars stand in hot water until ready to use. Place lids in water in a small pan, bring to a low simmer, and hold there until ready to use. 1.) In a large sauce pan, combine mashed pears with grated ginger, lemon juice and calcium water. 2.) In a separate bowl, combine sugar and pectin powder. 3.) Bring pear mixture to a boil, then add sugar mixture and stir vigorously for 1-2 minutes to dissolve the pectin. Allow mixture to come back to a boil, then remove from heat. 4.) 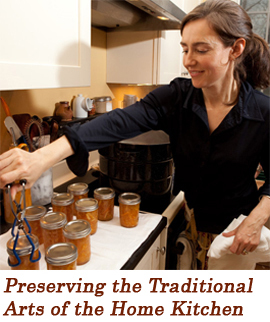 Remove hot jars from canner and fill jars with jam, leaving 1/4 inch of headspace. Remove trapped air bubbles, wipe rims with a damp cloth, and put on lids and screw bands finger-tip tight. 5.) Place jars back in the canner, cover with lid, return to a rolling boil, and boil for 10 minutes. (Add 1 minute additional processing time for every 1000 feet above sea level.) Turn off heat and allow canner and jars to sit for 5 minutes. Then remove jars from canner and allow to cool undisturbed for 12-24 hours. Confirm that jars have sealed before storing in a cool, dry place. Sealed jars have a shelf life of 1 year. Once opened, keep jam in the refrigerator and use within two weeks. Enjoy! CanningCraft » Back at BU…for a bit of Canning!